Yes, you can use a figural candle to represent the person or you can use a poppet. Everything would be the same as if you were doing it on yourself. The only difference is that you're using a large white bowl (or the sink) instead of the bathtub. Take care and wishing you great success with your work! Can I dress the candle representing the person in appropriate oil and Sea salt and light the candle? I recommend that you bathe it for 13 days with the 13 herb bath. Can I perform a cleansing ritual on me while I am working a honey jar and candles on a target? I was thinking about using van van and block Buster to remove obstacles, will this undo the spells I am currently working on? Can I also perform this cleansing on my target without hurting my spells on them? You should have done this before casting your spells. I would like to know if I can take a cleansing bath, let it air dry and cast a love spell afterwards.... Will it mix energies with the spell? Should rinse before casting the spell? The cleansing bath won't affect your spell, unless your intention is to cleanse away past negativity related to love or something like that. But it won't *hurt* your spell, no. There's no need to rinse before doing the love spell. I do my heavy work outdoors, and last night the wind shifted while I was saying the Psalm and I accidentally caught a few lungfuls of Break Up incense. Along with the usual hyssop bath afterward, I also drank a weak hyssop tea and let myself breathe in some sage smoke praying to be cleansed outside and in. I feel okay and haven't had any negative effects or signs. Do I need to do anything else? You did the right thing and you ought to be cleared. This is exactly what I do too. That makes me feel better about this happening to me, but sad for you-- I can't imagine Break Up oil tastes very good! But I'm glad to hear I handled this appropriately and appreciate your assurance and further recommendation. I had a reading this morning from an AIRR professional and apparently I pissed off the universe and created a mess with some previous work I have done which is blocking my current work. I was advised to do a 13 day hyssop bath & reconciliation work. I have ordered the necessary items from LM but there is an approx 2 week shipping time at the moment. Does anyone have any suggestions on what I can do while I wait for my products to arrive. I have a black chicken candle at home, would this help? I'm a little confused - did your AIRR advisor tell you to bathe with hyssop for 13 days or to use the 13 herb bath for 13 days? They are two different things (hyssop removes sin from performing curse work, and the 13 herb bath removes spiritual messes thrown at you from others). I have no idea what a black chicken candle is since Lucky Mojo does not sell them. We can't advise on products bought elsewhere. If you want to remove spiritual gunk that may be on you while you wait for your order to arrive, put kosher salt in your bath (immerse yourself) and recite Psalm 91 while you do so. You can also steep some basil and eucalyptus in boiling water, strain, cool and pour that over yourself as you stand in your bath. Remember to collect some of your bathwater in a cup and pour it out at a crossroads to help dispose of your former condition. What does this mean that you: "...pissed off the universe.."? I can't imagine that the entire universe would be mad at you. So, I'm confused. Miss Athena: She advised 13 days of hyssop. Thank you so much for the advice! Is it okay to do this bath in the evening time? Miss Aida: basically a guy I was dating left me to try and work things out with his ex, then I did a working to break them up and come back to me, which he did two months later... but I ended up turning him down in favor of someone else and hurt him really bad (as he had done to me). Now I regret my decision and want to get him back. She said the universe is mad at me because I went against my original spell. What should I use for a cleansing spell to clear negative e ergy from previous spellwork that was negative. I also feel like I went to a persons shop even though I usually stick with lucky mojo and I met her the first time. She said to me I know hoe you are and come back Ill show you how to fold the paper...etc... Bring ur photo with you and she also said here a prayer. Idk if zi should becareful cause she wanted alot of personal info like where I live etc. This woman sounds weird, and if you are getting a bad feeling from what she's saying, turn around and do NOT look back. She shouldn't be asking you where you live. Thank You sister Jean. I thought it was weird too. Id rather not give her personal info...I wssnt sure if she was trying to help me by asking to bring her a photograph of me and the guy I was dating but its weird. She also told me she knows me...but yet she just met me..Idk if she was a gypsy or a psychic but she dont know me and they try to get me to do a reading with her but I told them I dont need a reading. I just didnt like that plus they were tryna charge me like 90 bucks for supplies like uh no this is not good....Id rather continue to just use lucky mojo products plus lucky mojo isnt mineral oil its the real stuff. I appreciate your help Sister Jean. So I did a hyssop bath tonight with prayer and psalm 51 but do i have to dispose of the leftover bathwater I saved tonight or can I do it tomorrow? I placed it away from me until I dispose of it at the crossroads tomorrow. I also saved myself before and inside the bath. Sorry we didn't get to this question until today! I'm assuming you already took care of your bathwater, and if you waited I think that's fine. Yes I took care of it today Miss Jean, thank you for your reply. Also, I went out & got supplies today to make my own mojo bag for protection & cleansings for after I perform my spellwork. I obtained some LM fiery wall of protection & a pychic protection oil I plan on mixing together and adding it to my mojo bag with a black tourmaline stone, 3 pieces of devil's shoe strings, hyssop, sea salt, and sage. After I take my hyssop baths, do I anoint myself with these oils daily or only after the spiritual cleansings? Also how often do I anoint my mojo bag? I plan on stepping it up on my smudgings with sage too just too keep any negative spirits or energies from hanging around me after my workings. Will this be enough? I also bought LM fiery wall incense to burn. Lucky Mojo doesn't make or sell something called psychic protection oil, so I can't advise you on that. Please don't post on the forum about products that Lucky Mojo doesn't sell. You can apply the Lucky Mojo Fiery Wall of Protection oil as often as you like. You other work, the incense and such, sounds good. Without knowing what happened it's difficult to advice you. But if you feel that you have done wrong, the actions you mentioned would be good to take. I’ve been practicing magic for maybe 5 or 6 years and I’ve worked with a reader but this is the first time I’ve read this part of the form and I’m so sorry that I never read it sooner because in reading this form I just found out I have not cleansed myself properly and now I know why everything I touched seemed to fall apart and end negatively. I’ve been sick often mentally and physically out of nowhere and my love life has sucked even when it seemed so promising and I think I may have left my children open for negativity to affect them as well. My love spells have always worked but have never lasted. Ok so I need help asap! Please! Is there something I need to do to undo all those years of not working properly? I have 13 herbs bath and hyssop bath, should I do 13 herbs bath first and do one on my children? My children are one year apart so can they do it together? Followed by a hyssop bath? And I also what to do some reconciliation work for my ex now that I know what the problem is. Would I cleanse after the reconciliation work as well? Would I do everything one by one? Candle wise? Or can I burn candles for myself and my children (separate candles each) at once? I know this is a lot but anything can help please and thank you! Please don’t tell me to get a reading because I’ve had serval and They haven’t told me to cleanse myself I’m guessing they just thought I knew to since I have been practicing for so long. I would recommend taking a 13 Herb Bath first. That will take off any and all spiritual gunk that you are carrying around with you. You can help your children take this bath as well. Follow this bath with protection work. I think the Blockbuster and Healing work are optional here, depending on what your needs are, but if you feel you must do them, they would come after Protection. You don't need to cleanse after the Reconciliation work. Thank you Sister Jean, do I have to finish all 13 days before I start any other spell work? Like I have a honey jar that I just started again for my ex should I wait before continuing it? And do I take the bath first or clean my house spiritually first? I don't think you would need to wait to do work like a honey jar until you're finished bathing, since it's such friendly work. And I personally like to cleanse my home and then cleanse myself, because I get dirty while I'm cleaning my home, but that's just me. Clean the house before you start the work and after you end the work. I would also cleanse yourself after the preparation and starting of the work on the first day. Each day after I would wash my hands and face after each lighting of the candles and moving of the work, after the work is completed I would do another cleanse. Remember to read Psalms 51 while you prepare and take the bath. So although I’m new to the forum I’m not really new to hoodoo but this is the first year that I’ve actually done research and read books and things like that. I first tried it maybe 6 years ago and I never did it consent and I didn’t do it for long but when I first tried it I didn’t know about taking spiritual baths so I didn’t but I did only do love work a few reversal spells for love jinx. Anyway I’ve taken plenty of spiritual baths this year but I’m wondering could I have jinxed myself? I’m in a newer relationship and I seem to be having some of the same issues in this one that I did in the last one and the guys are completely different and so am I, I’ve matured so much. I’ve seen a reader and one told me that there was no jinx’s and two others told me that there was (I’ve been so confused I even thought maybe the reader I’d been seeing had jinxed me so I could continue to pay for her services) I know that has happened to others but anyway another thought that I’ve had was maybe I jinxed myself because of working with a lack of true knowledge of how to practice spell work. I was doing so much love work and no cleaning and I just recently went to the doctors which is why this on on my mind now. Im always tired during the day and up during the night. I have cloudy thought and I really can’t focus when it comes to me moving forward to try to better myself. I have low energy and I’m often sick. None of which I experienced before trying hoodoo. I’ve been tested for almost everything and the doctors and specialist all say I’m completely healthy physically and mentally so my question is how can I clean myself properly to fix this problem and to make sure it doesn’t return? Is there something I can use for my tiredness? Energy? I know this may not be the case but I have tried everything. Thank you guys in advance for your help. That will be a great first step. Let us know how you're feeling after that and if you need more help. The idea of it coming back would only happen if the person reverses it bak to you, best way to protect against that is to wear fiery wall of protection, burn protection or cleansing products in your house, and to clean it with ammonia, a spiritual bath or chinese floor wash. then you bath to remove anything from yourself. In your case you can clean the area with the florida water, then smoke the house with incense or sage, clean the house with ammonia or chinese floor wash and take a spiritual bath. 1) is there any concern for the residual oils, wax, etc? 2) maybe it's an OCD type of fear but i tend to worry about if something touched something, and then i touch it later, etc. like, if i move the stuff off the altar, and then move it back, do i have to worry about cleaning the altar, AS WELL AS where i moved it temporarily? 3) Or have i watched too many movies where bad stuff happens under these conditions? 1) No. People keep and use oils and minerals and altars for months, weeks, even years. 2) OCD is not a useful part of magical practice. Contamination phobias are self-limiting and even self-crippling. They are not not a part of African American folklore or folk magic. 3) You may indeed have watched too many movies in which "scary things happen." Some movies teach that "children are scary" or "gangs are scary" or "clowns are scary" or "toys are scary" or "ghosts are scary" or "men you fall in love with are scary" -- and certainly the theme of "magic is scary" is one of the common plot devices in horror films. Here I come weary in body, weary in soul, and weary in spirit. The questions I have are multifaceted in nature, and each question I have could be placed in a different thread, but the way I'm going to post this seems appropriative as subsumed by this thread topic. Many of the moderators here are aware of the health issues and personality traits that can lead to reckless spending and financial ruin -- particularly those who shop to relieve anxiety and the hypomania/mania facet of manic-depressive illness. In addition, if those two clinical domains are comorbid, things can really get out of hand; it can even disrupt steady employment. Medication can fix this. I've had multiple career jobs, that for some reason or other, end, despite my inward will to modify such an outcome. All the money I make and am given seems to slip through my hands like sand -- so matter the job. I've been using a few household baths to rid myself of tricks that may have been laid for me, but my curiosity leads me to ask if there are certain spells over a particular domain of life that require more serious work to break a spell. I would love -- because I'm quite (this message is getting too long) sure I've been worked on because nobody who's tried with the will I have regresses in their finances the way I have (personality and clinical factors notwithstanding) -- to know of any baths that may help work as a panacea to remove, particularly, and specifically, as a blockbuster kind of bath to break any encumbrances on my cash flow. And suppose my work issues are due to back luck (whether having been tricked or not), is there a bath (preferably the same as the one I'm asking for above), that can help keep me in a job that matches my skills (I have legal troubles that can limit the type of work I'm trained in, but the field I'm in is very sympathetic to those in my circumstances given my health); and more than that, to be able to maintain it -- for bad luck and jinx breaking over my money's sake? My narrow vision of a hopeful future I fear is the work of someone who's deliberately placed me in crossed conditions, and they have been for quite a while because there's just no way... I am a gifted writer, and the last request is for not only removed blockages but getting to a place where I can maintain success in the field of my passion, writing. I've been published as an author, but have worked on the same novel for five years, coming no closer to an end -- another blockage. Are there any somewhat contractual agreements I can make with Spirit that would allow me great success for the pride I take in my work so that sacrifice might be necessary -- or is a sacrifice of prayer and praise enough. 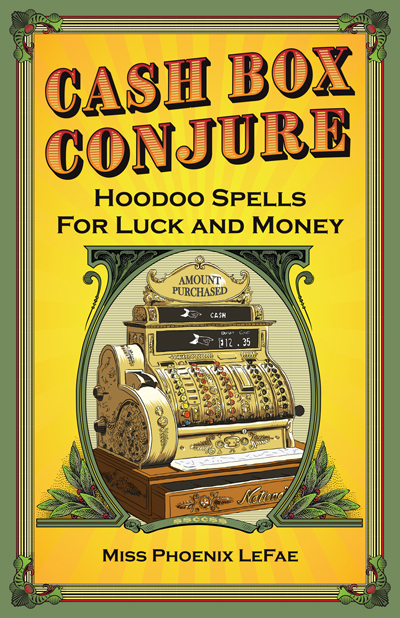 I'd love a guarantee of success in writing -- sort of like a binding contract if such a thing can be found in hoodoo, a one time spell or ritual that lasts a lifetime. Thank you for reading. Hope you all had a Happy Holiday and I hope to each of you a prosperous new year. I'm going to lie down as this weariness has led to fatigue. "I would love...to know of any baths that may help work as a panacea to remove, particularly, and specifically, as a blockbuster kind of bath to break any encumbrances on my cash flow"
I believe you answered your own question here, Blockbuster. Though if this is from someone working against you, a cleansing or uncrossing type bath might be a good idea to start with before a blockbuster one. "...is there a bath..that can help keep me in a job that matches my skills...and more than that, to be able to maintain it -- for bad luck and jinx breaking over my money's sake?" Your next to last paragraph, i'm sorry to say, I don't really understand. However I can tell you there is really nothing that "lasts a lifetime". Think of it like mundane bathing. You get dirty, you take a bath. Your bound to get dirty again, just because you took the bath doesn't mean you'll never get dirty again. I hope I was able to at least answer a few of your questions and also that your able to free yourself from these burdens. Good luck! Greetings and Welcome! We are glad you found us. You post was not off topic for the types of situations we address however it was off topic for the forum where it was posted so I have moved your inquiry has been moved to its appropriate forum. This is a very good question. When performing any kind of spell work, especially a curse, it is always important to be both physically AND spiritually clean. After taking a regular bath to get your body clean, taking a spiritual bath for removal of any unwanted spiritual influences or to draw desired spiritual influences is highly recommended. If the spell was of a baneful nature meant to cause harm, you want to purge yourself with a hyssop bath right after and ask God for forgiveness. This is usually done while reciting the the 51st Psalm. A simple bath (I learned from Ms Elvyra - I think - during a reading) is to mix a few tablespoons of salt and a few tablespoons of apple cider vinegar in water and wash yourself with it when you shower. I do this daily or at least three times a week. I sometimes add a splash of Florida Water for extra punch. For me, this is a good maintenance wash that keeps me cleansed, clear, and open.